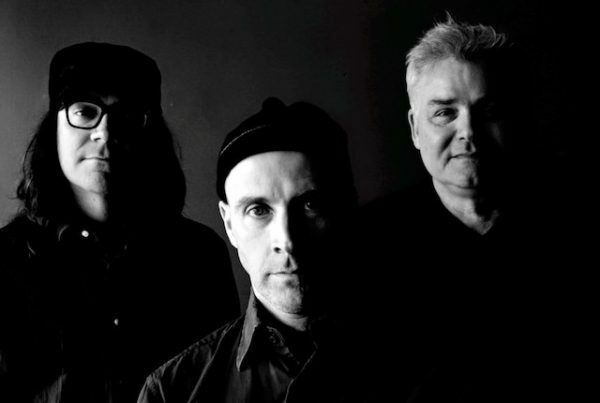 The Messthetics. One part jazz/experimental guitar, two parts Fugazi. Joining Joe Lally on bass and Brendan Canty on drums (with the bell, naturally) in what we are told is their first band since Fugazi’s hiatus in 2002 is Anthony Pirog on guitar. Their eponymous debut, released almost a year ago, is comprised of nine songs recorded live (and “mostly without overdubs”). If you’ve not heard the album, you need to check it out right now, here. Their microphone-less musical conversations cover an array of dynamically shaped and shaded areas. While the songs bear a theme, a motif, a structure, these are not allowed to hold the band or the music rigidly in place. Instead, they serve to facilitate the band’s organic musical dexterity, precisely what we witnessed here tonight at Kings Heath’s Hare & Hounds. Lally and Canty are tight. Whether going for the groove, heading into the hypnotic, edging into the experimental, or moving through the melodic, Lally’s bass lines and Canty’s rhythms, beats and flourishes are simple, powerful and irresistible. Together, they provide a foundation that is solid, every note and every hit being necessary to the music. There is no excess or superfluity to their grooves, and neither is anything lacking. Then we have Anthony Pirog. Pirog is not a guitarist. Well, not a normal guitarist anyway. Yes, he’s got a guitar and he can play it very well. But the term “guitarist” is nowhere near adequate because it doesn’t encapsulate what he does with his instrument. The music, the melodies, the riffs, the experimental sounds, shapes and layers of noise begin with the guitar, yes, but when the notes find their way into the array of effects at his feet, that’s where Pirog becomes something more than a guitarist, and in some ways more than a musician. The at-times orchestral sounds that emerge have a depth and a breadth to them that is music, sound, shape, texture, and much more. None of this, however, is to say that he’s dependent in any way on the effects for his craft. Nor is it to say that he somehow positions himself as something other or apart from the band to enter into his own realm of sonic experimentation and relegating the bass and drums to the lowly position of “backing band” or “rhythm section”. Far from it. When the band let rip and dig into the grooves, Pirog, Lally and Canty are a unit and wherever Pirog goes with his guitar and arsenal of effects, it’s within the realms of The Messthetics combined aesthetic vision. And to witness three people create such a wonderfully rich, dynamic, diverse, dense and undeniably beautiful sound before one’s eyes is nothing less than staggering. Hyperbole? If you’d have been there, you’d have to agree. If they are playing anywhere near you, make sure you are there.